In order to find an adequate substitute when I need to clean out the system, I look for foods and recipes that are substantial yet light, simple yet colorful. I need a bit of saltiness to curb cravings but almost no fat to make the swap worth it. With a gorgeous dressing and very fresh flavors, this healthy couscous salad can almost fill the void of a pepperoni pizza. Almost. 1. Bring chicken stock to a boil with a generous pinch of salt. Add couscous, cover with a lid, and turn off heat. Leave for 5-7 minutes, allowing couscous to absorb liquid and cook through. Remove lid and use a fork to fluff the couscous. 2. In a large bowl, whisk honey, lemon juice, balsamic vinegar, salt, and pepper. Season to taste. Add couscous, cubed beets, and feta. Gently toss together until entire mixture is coated in dressing. 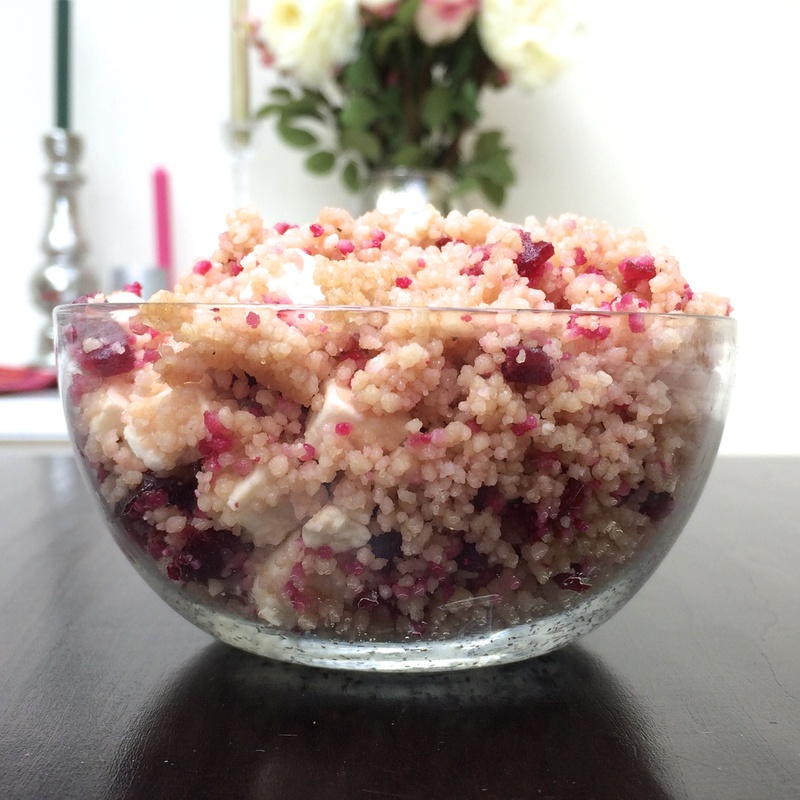 Enjoy beetroot couscous salad with Elizabeth Gilbert’s Eat, Pray, Love, and check in at http://warandpeach.com for future recipes and book reviews! This Friday I’m flying home to Bryn Mawr for a couple of weeks. There are so many amazing memories I associate with my home, particularly surrounding weekend meals. It begins at the Farmers’ Market on Saturday morning to prepare for the upcoming 36 hours of culinary bliss. Depending on the time of year, dinner could be a rich bowl of boeuf bourguignon, a divine plate of chicken parmesan, or a simple swordfish steak with risotto on the side. The risotto has always been my absolute favorite – the absolute crème de la crème. Swordfish and risotto season is the best. It is the time of year when a crisp glass of white wine hits the spot. It is the time of year when I can sit on my back patio, reading, while my dog lovingly lays by my side in the summer breeze. Like the naughty but lovable title character of John Grogan’s Marley and Me, a dog can provide such comfort. Though they do require a heaping amount of tender loving care, like the delicate grains of a perfect risotto, the reward is worth it. At times a bit temperamental, riled up pups and heat sensitive risottos can be alleviated with some gentle affection. I can’t wait for four days from now; there is nothing like the comfort of a bowl of my father’s risotto and my dog lying at my feet. 1. Heat olive oil in saucepan over medium heat. Sweat onions until soft and translucent. Add barley and sauté until it turns translucent. (Another trick for sautéing the barley is to listen until you hear it “crying.”) Add white wine and stir, allowing barley to absorb the moisture. 2. About 1/2 cup at a time, incorporate chicken stock. After each addition, allow the barley to absorb the liquid on a gentle simmer. After 3 cups of stock have been added, try a barley grain. If still relatively crunchy, continue to add liquid. If al dente but bouncy, barley is ready. 3. When barley is ready, squeeze lemon juice into saucepan; stir. Turn off heat and add Parmesan, stirring to let the residual heat melt the cheese. 4. Optional: form bacon strips into disks using muffin tin and slightly smaller (oven safe) cookie cutter. Cook bacon at 375 degrees for 15-20 minutes; until crispy. 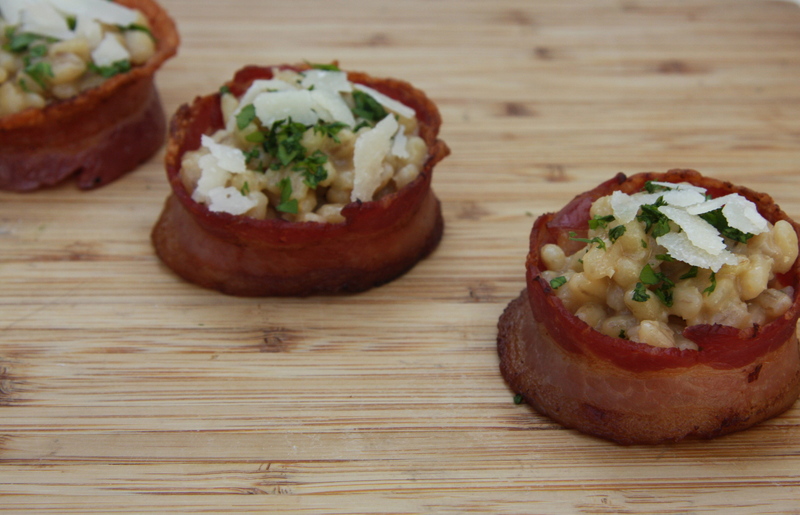 Fill bacon disks with barley; garnish with parsley and Parmesan shavings. Enjoy barley risotto with John Grogan’s Marley and Me, and check in at http://warandpeach.com for future recipes and book reviews! I’ve been assigned to read The Awakening for several classes during many phases of life. Because of the times during which it’s cropped up in my life – early high school, early college, and finally late college – the novel has become a vehicle for reflecting on my own coming of age. For instance, the first time I read the book was during my freshman year of high school. This was the time in my life when my journal entries bemoaned personal flaws and the reasons no boys liked me. Like Chopin’s protagonist, Edna, it is easy to feel trapped in a situation, unable to see the bright future because the current situation seems so bleak. The Awakening has followed me through many phases of life – ups, downs, failed pancakes, amazing pancakes. And depending on how much red wine you put in that syrup, you might go through these phases feeling like Edna, drifting away on the waves. 1. In small bowl, whisk flour, sugar, baking powder, salt, and lemon zest. 2. In large bowl, whisk milk, egg, vanilla extract. 3. 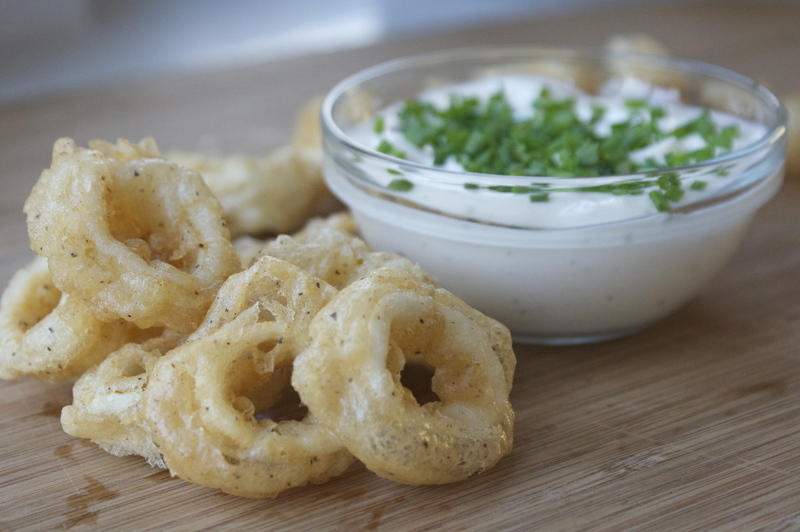 In three separate batches, incorporate the dry ingredients into the wet. When combined, add veg oil and whisk again. The batter should be a bit lumpy. Fold in blueberries until incorporated. 4. Add a bit of veg oil to a large fry pan and ladle pancake batter in. (I make three at a time.) Flip when small bubbles begin to form on the top and cook for about a minute further on the second side (until light brown). 1. In small saucepan on medium heat, dissolve sugar in water and red wine. Allow liquid to reduce until a syrupy consistency. Pour on top of lemon blueberry pancakes and enjoy a decadent breakfast! Red wine for breakfast? It’s 5:00 somewhere! 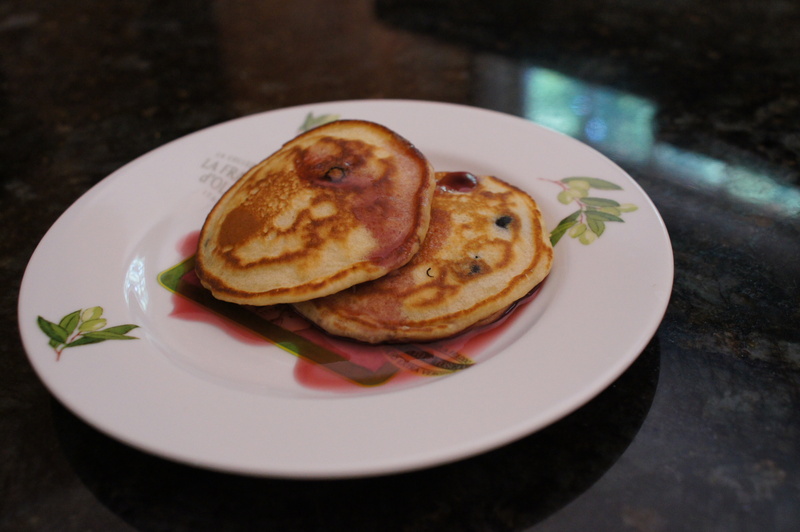 Enjoy Lemon Blueberry Pancakes in Red Wine Syrup with Kate Chopin’s The Awakening, and check in at http://warandpeach.com for future recipes and book reviews! One of my favorite things to do during summertime evenings is put on jazz and enjoy a refreshing cocktail. In so many of his books, F. Scott Fitzgerald paints the Jazz Age as a time when the hand was perpetually holding a champagne glass and the foot was constantly tapping along to a syncopated tune. But Princeton student Amory Blaine in This Side of Paradise reminds me how cocktail hour and the luxuries of adulthood are not a privilege; they are an earned right that can only be enjoyed after the ever-bumpy ‘coming of age’ progression. This Side of Paradise is a novel that, though written and set almost a century ago, describes every college student’s slog. Throughout the novel, Amory learns to occupy the space between parental impact, proper mentorship, academic vocation, and relationships stopping and starting. Just as the punch of lemon zest blends with mature thyme and elegant pear, seemingly different components of Amory’s (and any eighteen-ish year old’s) life slowly come together and begin to make sense. I am able to compare my own time at college with Amory’s from the calm of my back porch as a jazz melody softly plays from inside. Though my roaring twenties are far from over, I am able to enjoy a side of paradise that can only come from cocktail hour. 1. 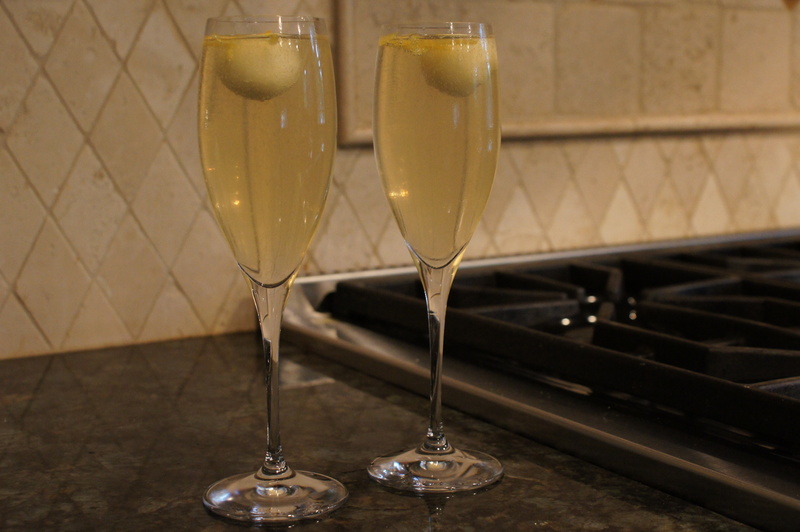 Use a melon baller (also known as a Parisienne scoop) to make small pear balls. Put in freezer on parchment paper and leave for at least an hour. 2. In a small saucepan, add water, sugar, thyme, remaining pear trimmings, and lemon zest. Heat until sugar has dissolved, then set aside to cool down and infuse. 3. Strain simple syrup and shake over ice with vodka and lemon juice. 4. Fill about a third of your cocktail glass with the vodka mixture. Top with champagne. Garnish with frozen pear balls and lemon zest. Enjoy this summery cocktail with This Side of Paradise by F. Scott Fitzgerald, and check in at warandpeach.wordpress.com for future recipes and book reviews. Cheers!